What did you learn about Wycliffe that you had no idea about prior to the project? When I initially filled out the survey I put Wycliffe at number three. I knew that he was influential in translating the Bible into English – an undertaking which we often take for granted. What I didn’t realize was just how much of an influence he played in planting the seeds for the reformaiton movement that would follow. Wycliffe’s work was passed on to John Hus and ultimately to Martin Luther, as well as many others. I had no idea that the doctrines which were questioned by the Reformers of the 1500’s were first questioned by Wycliffe two hundred years before. If I were to fill out that same survey today, I would put Wycliffe in the number one spot. He has had an incalculable influence on Christian history, and most people don’t even know how. Does your impression of the person change at all, after your research and writing? There is no doubt that my impression of Wycliffe changed as a result of what I learned. While I always considered him the “Father of the English Bible” I see him now as the “Father of the Reformation.” What I learned that struck me most was that the themes of the Reformation (papal power, the authority of the Word of God, the abuse of church authority, the priesthood of all believers) were proclaimed first by Wycliffe in England. It was also amazing to see God’s hand at work in protecting Wycliffe from the church by the English govenment at a very unique time in European history. I am a student of history, and this study opened my eyes to see the Reformation in a much wider scope. It helped me to understand the importance of standing up for the truth no matter what power may oppose you. Jesus tells us to take up our cross and follow him. When we oppose the world or even the church in order to remain faithful to God and His Word, we are doing what we have been called to do, and we can be sure that God will be with us – whether we give our life for that truth or whether he preserves us and uses our voice as a call to arms for others who will follow. What is the most inspirational part of Wycliffe’s life,in your opinion? His dedication to producing an English Bible when only a few people supported him is a testament to God’s grace. He was also a vigorous student of God’s Word, and his study led him to faithfully uphold and proclaim what he had come to know. We should all be such a student of God’s Word, and pray that God would grant us the courage to stand faithfully upon it! Do you think most Christians would benefit in a practical or spiritual way from knowing more about Wycliffe? 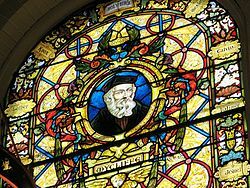 I believe any Christian can benefit from learning about the life and work of John Wycliffe. When I finished my biography on Wycliffe I gave it to my two teen-aged children to read. Both were impressed by different aspects of Wycliffe’s life and dedication. His life was broad and deep and it can and will affect different people in various ways. But the lessons to be learned are great and dynamic for each of us. I don’t think anyone will come away from learning about the “Morning Star of the Reformation” the same as they were before. This entry was posted in Uncategorized and tagged lutheran, nathanael mayhew, protestant, reformation, wycliffe by kql314. Bookmark the permalink.